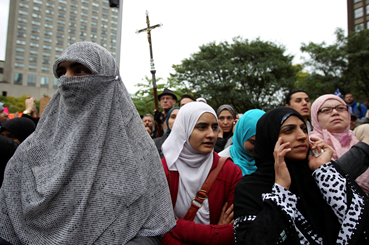 A 2013 Protest in Montreal against a proposal to restrict public employees from wearing face veils. Photo: Christinne Muschi/Reuters. Last Thursday, the government of Quebec proposed a bill that would restrict all public employees from wearing religious symbols in the workplace. Among the public jobs affected are schoolteachers, judges, police officers and attorneys. The bill would restrict them from wearing Muslim head scarves, Catholic crosses, Jewish skullcaps or Sikh turbans. The bill is expected to be passed in the Quebec legislature by a majority vote from the province’s dominant right-wing party. However, the bill has received widespread criticism from Prime Minister Justin Trudeau, other public servants, and legal experts. The clause is a constitutional loophole would enable any Canadian legislature to override the constitutional rights to freedom of religion and expression. While the clause may be invoked whenever thought necessary to serve or protect public interest, it is rarely used. While the Quebec government believes the legislation will preserve the province’s history of secularism, critics view it as a breach of religious freedom that conflicts with Canadian efforts to promote openness and multiculturalism. The bill exemplifies the struggle that the United States, France, and other Western countries have with the recent influx of immigration from Muslim-majority nations. The recent move by the Quebec government closely resembles the French policy of laïcité, a strict form of secularism. In France, women are restricted from wearing full-face veils in public places and Muslim students are prohibited from wearing headscarves in schools. The bill is said to have a particularly discriminatory effect on Muslim women, who are the demographic of people specifically targeted by the proposed public ban on Islamic headscarves. The largest teachers’ union in Quebec has recently filed a legal challenge against the government, protesting inquiries by state officials into the number of public teachers who wear religious symbols. Such a request is claimed to have breached Quebec’s Charter of Rights and Freedoms.